Instead, why don’t we listen to the one who knows! Take it away Carly and Thank you! A ghastly, not gassy, career choice indeed! And yet an affliction plaguing many. Everyone is a writer, but not everyone has support – so let’s hear if for the club! Open to one and all just skip on over! Last month, on Wednesday 1 of April, I was honored to be attending a workshop in Portland, Oregon with Larry Brooks and a great number of talented authors. His tutelage should, absolutely, be the 1st letter in the alphabet when thinking about sitting down and penning a spectacular piece of literary art. There are many considerations to navigate. Putting one word in front of the other is not the only talent for success. Excitement and common sense have a tendency to cross in the night and end up on Pluto. Oh’ good morning my sappy writer friends and to all those who know better, lol! What a day, what a life, what it means to surround yourself with those of a similar, twisted, like mind. Do you remember the wild ride? Yes, the nauseating thrill that beckons us forward, casting a voodoo spell until we vomit from excitement and exhaustion. I would imagine the same can be said in all of our passions, albeit I speak of mine, writing, scribbling, dabbling with a pen, chewing the lid until plastic shards fill your mouth and your lips become covered in an explosion of red. It is that gnawing creature inside inking its way out. Simple questions, like, “What is conceptual about this? Substance, sprinkled appropriately, given straight. The beauty of dissecting our thoughts saves us time and sanity. As a glorified rambler, babbler, pantser, sitter down and jumper in, I recognize the need in myself for this framework, before. If I am truly serious, this I will do. 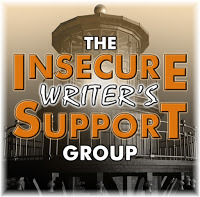 Insecure Writers Unite –arm yourselves with the appropriate weapons to slay these inner gremlins, ultimately, holding us back, allowing clarity of our vision to be seen, when planned appropriately. Skip the 18 drafts and cut that time in half, reach for the light! Are you kidding me? We are so there! Done and done says Sandi and me! After the two of us have attended Writing Conferences and Webinars and Many Other Costly Programs and Writing Events … We assure you this is MONEY WELL SPENT! I don’t know how you are going to get there, but get there and BE afraid to learn more about writing and who you are as a storyteller than you would have ever imagined possible and expect to cry. Yes, happy, sad, mad, life-changing tears of reality! We have seen Larry at our Portland Conference for the last two years and like frightened newbies hid in the back afraid to be called upon or looked at for too long, shrinking in our seats if his gaze came too close. This past year we did edge closer to the fourth or fifth row, but our hands remained glued to our chairs. Go to, NO, run to http://www.novelintensives.com to sign up ASAP! Initially, we were told the class would be well over our price bucket – it is more than 50% OFF the pricing quoted in August 2015. Do you want to know how serious I am about this? I will forgo my morning Americano, take back the 800 bags of bottles lining my back shed, get a part-time job at McDonalds (might be an exaggeration), run to the blood bank, re-evaluate my Dyson addiction (sorry James) and make my husband dinner at least 3 2 of the 7 nights in a given week. Write On! ❤ Jessica! First, I’ll be there, so let me know if you will also. We can have coffee, libations or hang in the beautiful lobby and get some work done on our novels. Because trust me, Larry is a force to be reckoned with and he will work us hard. It is true. For the past 12 months, I have dedicated almost every single day to follow my individual pursuits. I have finished another manuscript while redrafting my first. I have lived from great highs to deep lows in encouragements and frustrations. My steadfast team has held my hand, pushed me forward, relished in my accomplishments, and attempted to wipe away my blubbers of disappointment. I have been lifted up and let down. I have won as I have lost and for the first time in – ever, I speak in first person. My life as a dreamer has earned me less than I have made since I was 13 years old. But I did get paid and that, in itself, was a moment of triumph. Not as a novelist, per se, but in copy editing and that is okay. So what is it I have learned to pass on to others who dream of this fantasy that does not leave us, penning words of whimsy or knowledge? If it is your passion, do it, whether it is in the dark or on the back of an envelope. If you have five minutes or five hours, it is all the same. Thoughts overflow and find their way to a page, a habit we cannot quit. Allow this voice to find you and guide you. Do not question ‘the Rules’ or allow well-placed advice to deviate you from your course. Just Write. That is what makes us a…writer. More time leads us to more self-pressure, self-doubt, and self-deprecation. And everything hinges on the same word, you. At my 2nd writer’s conference, the question was asked, “What is it that keeps you from writing?” And 90% of the room raised their hands to answer, “Time.” Last year, this was my answer, too. Today my response is, “ME.” While I have found my individual freedom to speak, I have also found a plethora of excuses or outside intrusions limiting me from my potential. “You are living your dream.” A statement from one of my very best friends. He is right. When dubiety and disappointment flood my brain, I remind myself, hearing him speak. The strong voice of one who does not write but knows me for the person I am. It matters not if I am a Plotter or a Pantser, an Amateur or Accredited, I am a writer, and I will forever tell stories as I see them told. I have to admit I quite enjoyed my original post on the importance of Gravatars (it was the 80’s hair band collage) in this world of cyber-space. The importance of bringing a personal perspective to what is almost impersonal. And because of a writer’s conference class I attended speaking specifically on the importance of online presence and peppering that miniature baby everywhere you went. Especially, on your blog/website and making an appearance on others. It’s like BAM here I am! BAM here I am again, and suddenly we feel like we know each other and vise-versa. When we make ourselves seen, and our presence felt enough, our voice can be heard without using any words. And the biggest reason I wanted to write Part Deux, forgetting the most important point that I wanted to make originally, (I somehow got caught up in all that hair) is that I look for you by that tiny representation. Your image whatever it might be when you hit the like button, and there you are — making me smile. It is a refreshing, breathtaking reminder of the time you have taken to say hello. And I will admit…I fall in love a little with each of you.